ECU Remapping removes the restrictions placed on a vehicles engine by the manufacturer. This is achived by overwriting the standard ecu software with a tuned opitomised custom upgrade. Remapping is a performance conversion that will seriously improve the power of the engine and the durability of your car. In the early 1990’s vehicle manufactures introduced the Engine Control Unit (ECU), this is an on board computer that tells your engine what to do and when to do it. In the early days Electronic Engineers started to change the chips in the ECU and upgrade them to deliver better engine performance, this was known as Chip Tuning. 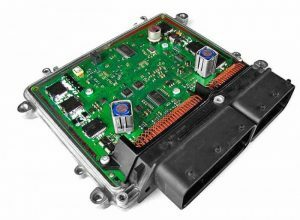 By the late 1990’s all major manufactures had introduced the ECU. Advancement in technology means we no longer change chips, but custom design software ‘called a Map’ for the ECU with optimised instructions to run the engine. The Vehicles ECU is mapped by the manufacture at the factory when new with standard instructions, but does not take into account the local geo conditions; this makes the engine perform below its true potential, but like humans all engines, petrol and diesel are different, so really do need a bespoke map to help them perform to their best. At RPT we test your vehicle on our Dyno, then take a reading of your ecu map via the onboard diagnostic port. Our mapping technicians then create a new Map to enable your vehicle to obtain its true potential. This in most cases means an improvement of up to 30% in power and 35% torque. Results show 0 to 60 times come down, flat spots are removed leaving a more responsive engine along with better fuel economy. We can also remove any speed limiters that may have been imposed on you’re engine. We do not touch the ECU as in most cases the remapped software is installed electronically and remotely through the car’s diagnostic port; there are no replacement chips to upgrade or install. Should you want to re-install the original map at any time, we can do that, as we keep a copy of all maps. No one but you will know your vehicle has been remapped, so the warranty on new vehicles will not be affected. RPT Bangkok Thailand has installed the latest AWD7500 4 wheel drive Dynamometer, the first in Asia.This allows us to look at your vehicles engine across its full operating range, then make adjustments to enable more of the full potential of your engine to be used. We also provide a dyno hire for engine tuners.